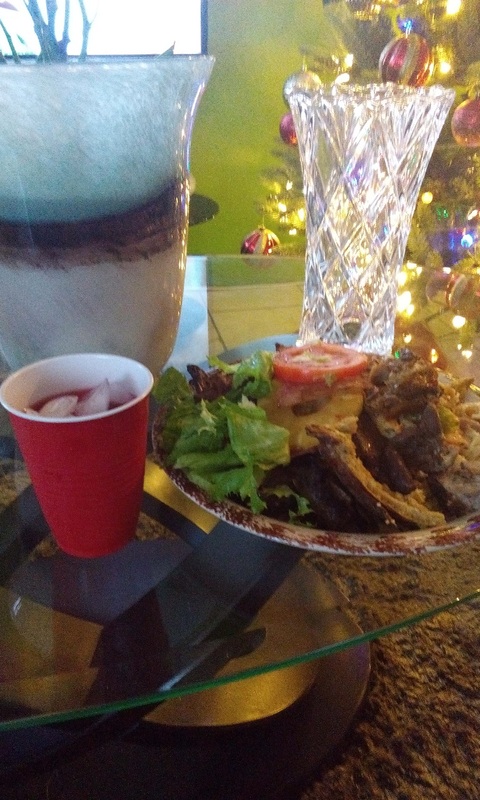 My Jamaican Christmas dinner December 25,2017. A cup of sorrel drink, sliced ham, jerked pork, roasted pork, baked, chicken, roasted chicken, jerked chicken, oxtail and beans, steak, curried mutton, roasted beef, fried ripe plantains, chicken shrimp alfredo pasta, potato salad, tossed vegetable salad, white rice, rice with gungo peas, baked sweet potato and rotti...Man im stuffed..I had no break fast, no lunch and I went to bed hungry last night just to create room in my stomach for this very special meal wonderful ly cooked with love and passion by Mrs. Leonie Alert.... My entire family is away for the holidays. I was home alone but God answer ed my prayers, and I am now spending Christmasmas with a wonderful family. Merry Christmas to you all and to all a good night.